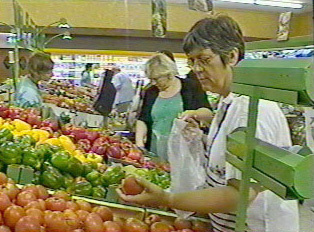 Much of the shopping for food is done on a weekly basis at large chain supermarkets in the malls. As in the United States, it is possible to buy everything one needs at the same store. Some prefer to buy meat at the supermarket, where the quality is guaranteed. Many also buy their beef in bulk from local farmers, where the meat is fresh and well regulated. It is also possible to buy farm-raised rabbits, chicken, lamb, milk and eggs at the farm. Others shop at the large outdoor market that opens up for one morning per week, where either local vendors or farmers from across the borders sell eggs and cheese, cooked and raw meat and poultry, fruit, vegetables and fresh flowers. Many shops specialize in one product. The bakery sells fresh bread either in loaves or slices. Bakeries also sell sandwiches and slices of pizza at lunch. Butcher shops are plentiful, and numerous smaller shops specialize in chocolate and other elaborate sweets. Along the highways, convenience stores sell gas as well as a variety of groceries. These stores are open longer than regular stores, operating from 7:00 a.m. to approximately 10:00 p.m., Monday through Saturday. Also open on Sunday, they sell fresh-baked goods in the morning when most other stores are closed. In more rural areas, one can also occasionally find small Portuguese markets. Wine and alcohol are sold at the supermarket and in convenience stores. Although there is an official drinking age of 18, it is rarely observed.